Are Antivirus Applications the Biggest Threat to your Android Devices? The first thing that comes to our mind when our Android devices (or any other device/system in general) face a malware attack, is finding a good security solution, like an anti-virus app. There are a lot of options when it comes to finding an anti-virus app. However, a large number of these apps have been found to be of little to no use. 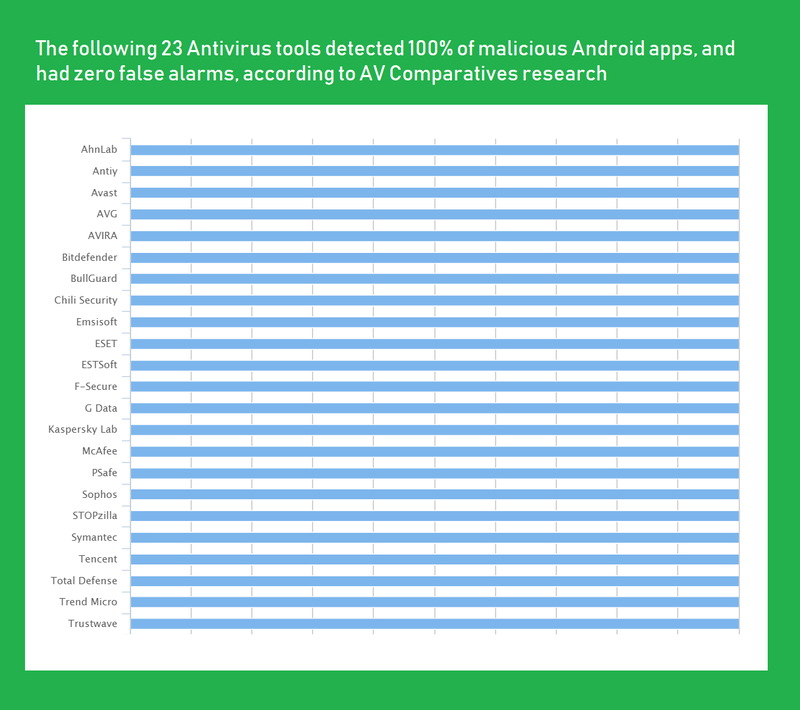 Thanks to AV-Comparatives for sharing their research results, conducted on 250 security/anti-virus apps. The results were quite surprising in a sense. While it was revealed that most apps didn’t contribute much in securing a device and were basically “useless”, some of the apps were flagged as malware and immediately removed from Google Play Store. As expected, the anti-virus products from well-reputed and leading industries such as Avast, AVG, BitDefender, ESET, Kaspersky Lab, McAfee, etc. were revealed to be providing the best security, even to Android Devices. In fact, 23 of the tested products (featured in above chart) scored highly on the test (detected all of the malware samples). In the test, 2018’s most commonly used Android apps infected with malware were used. The top products from the leading vendors were quite impressive in detecting these threats. It was also stated that for maintaining their efficiency, the products are regularly examined and constantly improved. Also Read: Several 18-24 year olds have chosen hacking as their profession... and it is not a bad thing! Now moving towards the disappointing side of the results. It was revealed that 138 out of 250 tested security applications were deemed useless, with a detection rate of less than 30%. Thus, trusting these apps with our security devices should be out of the question. In addition to that, 32 vendors were removed from the Google Play Store entirely, as their offered products were not only considered useless, but flagged as malware as well, and the flagging was done by the well-reputed and top-rated security products. Along with the results, the experts also revealed the possible reason behind these anti-malware apps being risky. It was said that most of these apps are supposedly developed by either an unprofessional programmer or manufacturers who are not concerned about the security business in the first place. As for the test, a total of 100 uninfected and 2,000 infected APK files were moved to Android Devices. 80 tested applications were able to block over 30% of the infected files and interestingly, generated no false positives.